It’s laser-cut from 2mm and 3mm MDF, with a patch of ‘fun fur’ for the thatching. It also comes with extensive colour-printed instructions. The fit is good, and it is well-engineered. The building itself is a rectangle with two interior rooms. Three walls have windows, and one wall is blank. It is surrounded by a wooden walkway and an overhanging awning/roof. There is a nice-looking chimney supplied, but apparently I forgot to add it. I primed and painted all the pieces before assembly, which makes for much easier painting. Priming isn’t essential, but without it, the MDF tends to soak up paint like crazy. However the tolerances on this kit are extremely tight, so too much paint will interfere with the fit of the pieces. Be aware of how it fits together before you start painting. The roof has four sloped pieces that are glued together, and to a good, solid frame that helps align them. The instructions suggest that there can be difficulty getting them aligned because of all the angles, but it wasn’t really difficult. Because the tolerances are so close, I’d suggest that you assemble the interior walls then glue the outer walls around them. (And do not paint the wall surfaces that are glued together.) When dry, I filled what seams there were on the outer walls, and used a bit of the filler to add some texture to the walls themselves. Each window has a lintel, a sill, two sides, and a shutter (open or closed) and a frame that sits inside them. Again, be careful of painting the surfaces that glue together because they may not fit easily if you are careless. Don’t get me wrong, the resulting windows look great, and all the pieces make them easy to paint. They are engineered so that they align themselves for the most part, so in spite of the number of pieces they aren’t really difficult to assemble. The doors can also be assembled open or closed (or left unglued.) They have a handle assembly that looks like a block with two curved antennae. The instructions showed where they go, but not how. Eventually I realized that they fit into the door with the antennae pointing down, making a very convincing set of iron door handles. The floor and walkway are a single piece, and slot into place easily. The awning and supports also fit easily and cleanly. The roof just sits on top for easy removal. I had never tried the ‘fun fur’ thatching before, and it was complicated by the multiple angles of the roof, I aligned and glued one long side. When that was dry, I did the other long side. When that was dry, I folded the fabric at each end flat and slit it at the approximate centre of the wall. This left a flap on each end that overlapped the other side. I trimmed this flap where it overlapped the other, and glued them down. Then the fabric was dry, I brushed the fur with a toothbrush, blending over the joins. I used slightly dilute white glue and brushed it all downwards. When dry, I lightly primed the thatch, then brushed various tans and greys onto it. The fur supplied was black, and I had some doubts, but it actually worked well. While more complex than most laser-cut kits, this was easy to assemble, and a pleasure to build. The results make the extra complexity worth it. Available from Sally 4th. Being a gamer on the internet, I could not let my shrill complaints go without being voiced. 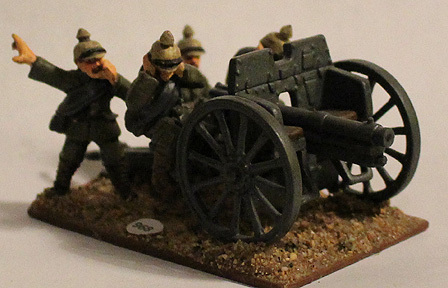 I wrote to the manufacturer, who answered me quite civilly that they were fantasy figures, not 1914 Germans. I tried to explain that my wants and opinions far outweighed any logic in the matter, and generously offered to shriek loudly until my concerns were met. 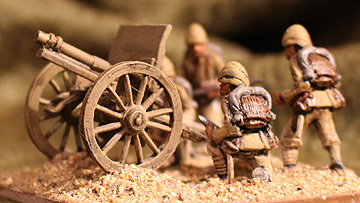 Several months later, Hinterland released a 6-figure set ‘Trench Raider Unit Builder’ containing 2 each of 3 poses, without gas masks and armed with rifles, exactly what I had asked for. 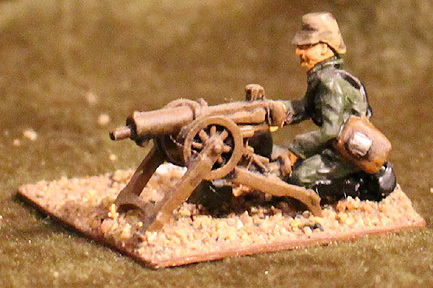 They also added a ‘Trench Raider HMG’ with a MG08, 2 crew, and a third figure with a bare head and a Bergmann SMG. Having made such a stink over the first releases, I felt I should put my money where my mouth was, so I ordered 3 sets and a HMG pack. They arrived in about a week (I’m in Canada) well packed and complete. The figures are beautifully-detailed, flash-free, and the bottoms of the bases came pre-sanded so they were flat. 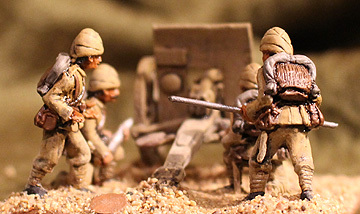 They are a small 28mm – They are small and slender women, in a smaller 28mm scale. They do NOT mix well with my RENEGADE 1914 Germans. The picture below shows in order, a RENEGADE German, a Hinterland Trench Raider, and a Ral Partha 25mm Zulu War Briton. The uniforms are an approximation of early war German uniforms: They wear y-strap suspenders, puttees, and jodphurs. One of the poses has a grenade at her belt, and two carry bags of them. I can live with this. 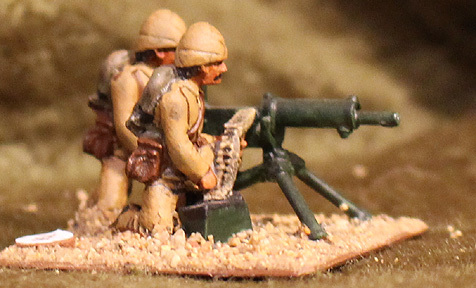 The machine gunner is the only figure wearing a pack: It’s sort of low-relief, and the mess kit is a flat indication rather than a solid piece. The loader seems tinier than most, but that’s mostly her pose. She lacks her MG drag straps. 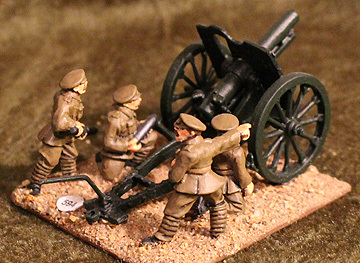 The HMG was a nice little model, but I replaced it with one from the spares box just for uniformity’s sake. The figures were a delight to paint. As I said, they are delicate, crisp, and well-detailed. I happily recommend them to anyone wanting female sort-of-German soldiers. I needed another opponent for my WW1 Russians, so I decided to build a Turkish force. I used the Copplestone Castings Back of Beyond Turks, because they are gorgeous figures. 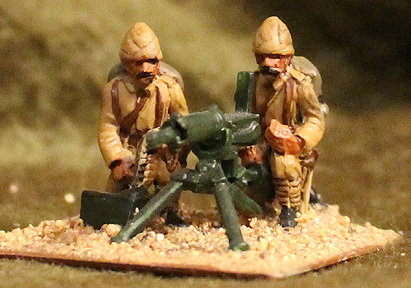 Unfortunately, the range is somewhat limited, having only Command, Infantry, and HMG & crew figures. I still needed Artillery. 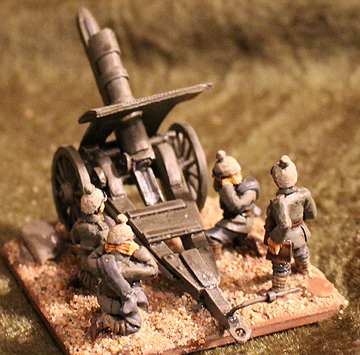 My first solution was to take the Back of Beyond Chinese field gun, and replace the heads on the crew. The uniforms aren’t perfectly accurate, but you can’t really see them well, clustered around the gun. I have absolutely no idea what type the gun represents. For a second piece, I turned to Irregular Miniatures‘ Very Useful Guns range, and picked up a German 77mm gun and Turkish crew. I found myself with a spare pair of kneeling Irregular Turks, so I removed their rifles, and paired them with a spare HMG from my parts box. They turned out well, I think. When building WW1 forces, you need more than Infantry. You need Machine Guns and Artillery.Unfortunately, what you want is sometimes not available. I built a WW1 BEF force from RENEGADE Early War British. I had to alter some hats to 1914 styles, but overall they are a good-looking range. But I wanted a small Canadian force so I could fight Second Ypres. The infantry was easy, I just painted them a different shade than the British. It’s not 100% correct, the uniforms were not identical, but it’s good enough for me. I made a Colt MG and crewed it with spare Artillery figures. 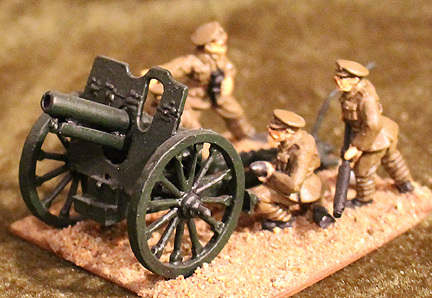 Most parts are from the Vickers guns, I just made the actual gun, from wire & putty. The crew is from the RENEGADE 18 pounder. 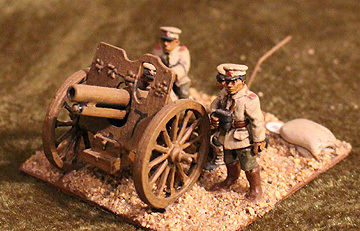 I bought another 4.5 in QF Howitzer for my Interwar Chinese. 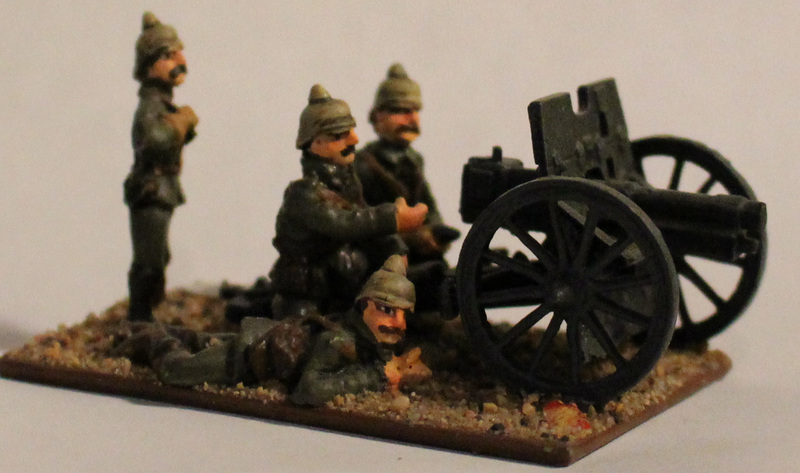 I used my Chinese Gun & Crew for my WW1 Turks. The crew are made from random Chinese figures from Copplestone Castings.